We've driven nearly 3000 miles in a rental car, west from Denver. We've traveled the length and breadth of Colorado, Wyoming, Idaho and Utah. We've toured 7 National Parks, 4 state parks and crossed umpteen white-knuckle, twisting, winding, sky high mountain ranges in ten days. We've trudged through dozens of blistering 110 degree deserts that could melt the freckles off your face...and I think they did. We've explored enough beautiful, yet sweltering canyons and gorges and buttes and mesas and plateaus to last a lifetime. We've hiked up steep mountain trails; down treacherous, rocky canyons; across burning desert sand; along rushing rivers and through thick forests til our legs begged for mercy. And we've done it all at an altitude considerably higher than what we're used to. The elevation where we live is 640 feet above sea level. The places out West where we've visited range from at least 5000 feet up to 12,000 feet above sea level. Even the hot desert altitudes are 6000 to 8000 feet. I've read that altitude sickness sets in around 8000 feet and can make you miserably sick for several days at any heights above that. I talked to a lady who moved to the mile-high city of Denver (5280 ft.) from Michigan and she told me that for the first solid month she was in Denver, both she and her husband suffered serious altitude sickness...which causes bad headaches, fever, dizziness, nausea. Luckily for us and maybe it's because we planned ahead and drank so much water, we did not suffer altitude sickness. We did get out of breath easily though. Most of the time when we were hiking and climbing, the small backpacks we carried felt like a two ton buffalo. The truth is we're exhausted. So we decided it was time for a little rest and relaxation. We also wanted to escape the throbbing, baking heat we'd been experiencing. We did not have a plan on where to go next. I got out my trusty laptop, googled around a bit and found what appeared to be a pretty little ski village in Colorado just up the road from Vail. We figured a mountain town high up in the Rockies would be refreshingly cool and probably not too crowded in the summer. What we found upon driving into Beaver Creek Resort was....heaven on earth. The second we stopped the car at the hotel entrance, my door was whisked open by the hotel manager himself, who said: "Welcome, Mr. and Mrs. Boomer. We've been expecting you." And with that he ushered us inside a magnificent hotel lobby and graciously upgraded us to the best room in the house. (I told him it was our anniversary...and it was...a few days earlier.) He had the valet park our car and led us upstairs to a gorgeous room with stunning views of the mountains. "We're at your service every moment you're here," he said. "Whatever you want, just ask." The hubs and I looked at each other and wondered if we'd inadvertently stumbled upon fantasy island. Or in this case Fantasy Mountain. Turns out this luxurious, four star, 350 room hotel had only a handful of rooms booked, as it was off season. We later learned that the entire staff was instructed by management to attend to our every need. We opened the French doors of our suite to a lovely balcony overlooking the village and the beautiful green ski slopes. We sucked in the glorious clean, cool mountain air. No bugs, no flies, no mosquitoes. Perfect weather. We didn't even need to turn on the A/C. The room was comfortably pleasant with the soft mountain breeze wafting through. We stepped out for a few minutes to check out the rest of the hotel. Only saw one other couple lounging by the pool. When we returned to the room, a plate of exquisite cheeses and a bottle of French champagne awaited us on the table, compliments of the hotel. There are few things so pleasurable in life as being pampered to the max at a fine hotel. This was all quite unexpected for us. For the next several days we soaked up the first class ambiance as much as we could. We hiked among the towering groves of aspen and pine. We strolled through the lovely, old world village of shops and restaurants, few people and no cars. We had the resort to ourselves! We explored a rushing creek bubbling up with fresh snow melt that cascaded all the way from the top of the mountain to the bottom. We saw scenic waterfalls up close and personal and meandered through mountain meadows bursting with wildflowers. We even climbed up a narrow, wooded path along side the grassy ski slopes to 9000 feet and lived to tell the tale, albeit gasping for breath. That's when we became concerned about bears. Afterall, this was definitely bear country...black bears and grizzly. We were told that if you whistle or talk loudly or sing...you'll let the bears know you're around and they won't be startled. So we sang: Smokey the Bear, Smokey the Bear, prowlin and a growlin and a sniffin the air. He can find a fire before it starts to flame. That's why they call him Smokey. That's how he got his name......over and over and over....all the way up the dense, leafy forest to 9000 feet. And I guess it worked because we saw no bears. They probably decided not to bother with the likes of us loonie, off-tune interlopers. Even though we're not big alcohol drinkers, we made great friends with the hotel bartender, Teddie. He gave us free drinks on the lovely bar veranda overlooking the mountains. Teddie regaled us with stories about the area and all the celebs he's met over the years during the winter ski season. We were the only people in the bar. We left Teddie a very generous tip. Dinner at the hotel's award winning, elegant restaurant was a slight let down. Personally, I do not like frou-frou food. Pretentious, over-priced, minimal and usually garnished with scraggly, paper-thin weed-like veggies to make it look fancy-schmancy. I've had much tastier crusted walleye fish in Michigan. My two slices of potato, each the size of a thin dime, were....ice cold. Ah but all was not lost. Near the end of our paltry and outrageously expensive meal, the waiter told us that our pal, Teddie was offering us complimentary after-dinner drinks on the veranda. So we leisurely ended the evening watching the sun set behind the snow-capped mountains, sipping gigantic mugs of delicious hot coffee laced with Baileys Irish Cream, grand marnier, and fra angelico topped with a heaping scoop of fresh whipped cream. Divine! There were numerous activities we could have availed ourselves during our stay in Beaver Creek Resort. But we opted to soak up the world class scenery, do some hiking and mostly relax. Our Wild West Adventure was nearly over and we wanted to decompress and unwind before we flew back home. 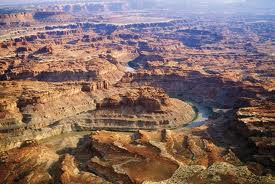 We started our little excursion hoping to discover the natural scenery of the American West. And we found it....in all its startling, stunning, magnificent, breathtaking, pristine, unforgiving, wild simplicity. In our culture today that values bling over beauty, chaos over quiet, crudeness over civility...the American West offers a pure, unvarnished, sublime, mostly uncrowded, calming escape from the pandemonium of our disordered world. The scenery is world class....like nothing else anywhere on the planet. We consider it a privilege that we were able to visit and physically explore such monumental natural and ancient landscapes that exist in the western United States. Although we've always appreciated nature, these experiences have changed both my husband and myself for the better. We understand that we are all connected to the natural world even if we don't live near it every day. It's the soundless tranquility of a scorching desert where you can hear the sun sizzle on the sand and rub your hands along a gigantic boulder that feels surprisingly cool to the touch. It's the tranquil calmness of the Grand Teton Mountains where the only sound you hear on a rocky, woodland path is the whisper of the wind. You hear the wind too on the edge of a high canyon rim looking down thousands of feet below you. The wind is different on the canyon top. Instead of whispering...it whistles. You have to be there. Or you have to be on the banks of a Rocky Mountain stream. Looking way, way up you see snow. Then midway down, you actually see the snow melting and you watch as the water tumbles down the mountain and forms a magnificent waterfall. Right before your very eyes, you've witnessed the creation of a waterfall. Where ever you are, it's all about being in the moment. On the very edge of a giant, gorge in Canyonlands with a sheer and ultimately fatal drop-off, I spied a lone patch of four yellow flowers growing off the twisted, rocky ledge. My eye caught something fluttering among these few sparse blooms. It was a tiny hummingbird...flitting from flower to flower. I was only inches away with my camera and was able to capture the unusual scene. It's all about the unexpected, precious, gem-stone moments of nature. In closing this account of our Wild West Adventure, I invite all of you to take a trip to this spectacular area of the country. It's wild, untamed and even dangerous. But above all....you will never forget the rare, raw, stark, unusual, unparalleled natural grandeur of the great American West. Rocky Mountain highs as seen from our hotel. View from our hotel room balcony. We hiked to top of green area...9000 ft. Some snow at highest elevations never melts in the Rockies. Magnificent views in Beaver Creek, Colorado. A lone hummingbird finds food high above the steep canyons. Solitary hummingbird in foreground on canyon rim with Colorado River far below. If there is one thing to know about Arches National Park in the summertime, it's this: The place is a hellish inferno. 110 degrees in the shade! Except there is NO shade. Nada. Zip. Zero. Not a smidgen. Forget that old adage about dry heat not being as uncomfortable as humid heat. The minute I stepped out of our air-conditioned car and into the searing, hot desert heat...I could feel my legs start to buckle. Thankfully my body didn't entirely cave to the ground and I was able to forge ahead. We brought tons of water with us, hats, sturdy hiking shoes, sun-block lotion and sunglasses. But all that didn't stop the intense heat from bearing down on us because Arches is smack in the middle of a vast, rugged, unforgiving, scalding desert. Although we felt like cookies baking in an oven, we found this inhospitable desert environment uniquely fascinating. Arches National Park is home to over 2000 natural stone arches, according to the brochure. Sounds like a hefty amount of arches. But we only saw about ten of them. That's because there are only a few arches out of 2000 located off the main paved park road. All the others are situated off the treacherous, sandy back roads...where a number of intrepid tourists have been stranded or died of thirst over the years. Yet to even access the arches off the main road was not easy. Many of them are not visible from the parking area. We were out in scorching heat. We had to climb up rocky hills, hike across slippery stones, maneuver through snake and scorpion infested brush and even squeeze through some gigantic, narrow boulders...to get a good, up-close-and-personal view of these ancient stone formations. We were disappointed that there was not easier access to some of the other 1990 arches. Apparently the bulk of the arches are way, way, way off road and accessible only by lengthy foot paths or all terrain vehicles. Normally a 2-3 mile hike doesn't faze us. But in this blazing heat...no way. If we had been here in the fall or spring...the climate would have been much more pleasant. Standing in the middle of this desolate land, I gained a first-hand appreciation of what it must be like to be stranded in a desert. It's a terrifying concept. I thought about the early native inhabitants and brave pioneers who trekked across these barren lands years ago. It's amazing that many of them actually survived. For us...this was a crazy form of eco tourism. Who in their right mind would venture into a fiery furnace desert just to see a bunch of rocks? Millions of tourists every year! That's who. The unusual arches, towering spires, weird rock shapes, gigantic balancing boulders that look like they could fall any second...all create a remarkable, unworldly landscape in the middle of this foreboding, arid setting. Most extraordinary to see. But once is quite enough for me. A hat always makes a good prop. Sandstone rock arches look like they're smooching. We had to squeeze through this narrow passage to view some arches. Red rock cliffs reflect in the waters of the Colorado River in Moab, Utah.